How often are we humans presented with opportunity, either having no knowledge to proceed or simply having too much doubt to believe we are capable. The ability to be competent is prevalent in all willing humans, the ability to follow signs is too subjective to determine. However, when an individual is able to master both competency and awareness of their own advantages, they are able to succeed in many aspects of life, climb any form of hierarchical ladder and become a real guide for generations to follow. Professor Mark Rust is the visiting professor from McDaniel’s main campus in Westminster, Maryland. 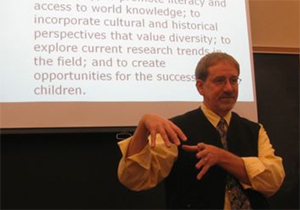 He currently runs the American Sign Language (ASL) department and coordinates the faculty program, he also teaches in the masters program, helping other individuals who hope to become educators in the ASL environment. I was given the pleasure of interviewing Rust, which led to a conversation which I greatly enjoyed. We spoke much of life, political and cultural shifts in society and a great deal about family, Rust grew up with deaf parents in the 1920s, and was no stranger to discrimination against deaf people who signed in public. As a child he was taught by his parents to never sign. “It was a no-no to sign out in public, don’t sign out in public because people would think you’re dumb…. It was the belief that to sign was the language of animals and at the time, to be a human you had to speak”. Rust theorized that his parents, who emigrated from Eastern Europe, were deaf in a time where deafness was stigmatized as an aftereffect of scarlet fever that was circulating in America in the 1920s. We discussed a lot about community and the roles society plays in enabling divisions of people, whether it is due to their identity or the language they are/were accustomed too. Rust saw a problem in our world and in the pursuit of his education he became aware of a path that was paved for him; becoming a medium for two cultures who for so long were unable to speak to each other. Rust has a wife and two daughters, one of which attended McDaniel, both campuses in fact. He’s traveled the world teaching in deaf schools, in countries such as Zimbabwe, Kenya and the Dominican Republic. Rust was fascinated by the campus in Budapest, he had visited about 10 years ago and observed an increased potential in the study abroad program lasting a full year instead of 6 months, “If you’re looking for a faculty member to make any impact with the student body in budapest, by the time the semester is in, you’re just feeling comfortable, you could do a whole lot more in the second semester.” He really saw the potential of our two schools becoming more interconnected and wanted to see more social integration between us. He continued, “ I’m so curious how all of these international students find McDaniel Budapest, how do all of these students find this campus? I am just amazed at the student body I wish there was a better way for me to plug in but is by walking the halls” He forgot to mention laughing. Making an impact was something Rust made a habit of. He supported and encouraged scholarships that allowed first generation college students to receive the opportunity of a higher education. Rust came from a working class background and saw first hand discrimination against deaf people. He fought hardships amongst this discrimination and endured to walk the path he had, and still was, gaining the tools for. In a sentence I would say Rust is an intelligent, resourceful man who successfully found true purpose. May his laugh forever echo in the halls of McDaniel.